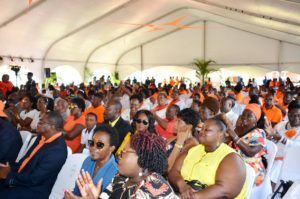 BASSETERRE, St. Kitts – Dr. George Walker, a seasoned politician of the New Democratic Party (NDP) out of St. Vincent and the Grenadines, recently weighed in on the constitutional matter unfolding in St. Kitts and Nevis where the leader of the Opposition, the Right Hon. Dr. Denzil Douglas, is found to have been issued and travelled on a diplomatic passport that lists his nationality as Dominican. Delivering fraternal greetings at the People’s Labour Party’s (PLP) second annual National Convention March 24, Walker said he clearly recalls when former prime minister Douglas launched a campaign to have People’s Action Movement (PAM) candidates Shawn Richards and Lindsay Grant disqualified from participating in the general elections because they held dual citizenship. In his presentation on the National Assembly Elections Amendment Bill 2009 tabled in Parliament July 3, 2009, Douglas passionately defended the Constitution where members of Parliament (elected and appointed) who hold dual citizenship are disqualified from representing the people in Parliament. “They did what was honourable, what was right; they did not hide, go into the dark; they did not shift the goal post during the football match to please or to protect themselves; they did not use legalities to shift the goal post, again they did what was honourable,” Walker said of the decision by Richards and Grant to renounce their American citizenship. Years later, Douglas now finds himself entangled in a situation where it has been found that he was issued a diplomatic passport of the Commonwealth of Dominica that lists his nationality as Dominican. The Parliamentary representative for St. Christopher No. 6 admitted in a sworn affidavit filed in the High Court Registry Feb. 21 that he filled out an application form and was issued with a diplomatic passport of the Commonwealth of Dominica, which he has used to travel. Douglas is next expected to appear in court on this matter April 20.